Project X Origins: Gold Book Band, Oxford Level 9: Blast Off to Mars! This Project X Origins Class Pack includes 1 set of guided reading notes and 24 reading books focusing on the theme: ''The Solar System'. 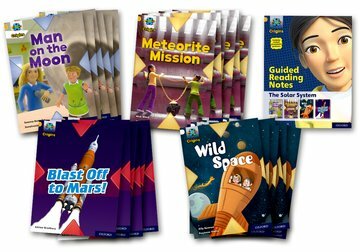 The titles include two action-packed adventures with the Project X characters: Man on the Moon and Meteorite Mission; one variety fiction book: Wild Space; and one non-fiction book: Blast Off to Mars!.